Select an existing element or an empty block by clicking on it (or by traversing the selection via cursor keys to it). Do a right click on the selected element and use the contextual menu "Add => Before" or "Add => After" to add a new element before or after the selected one. 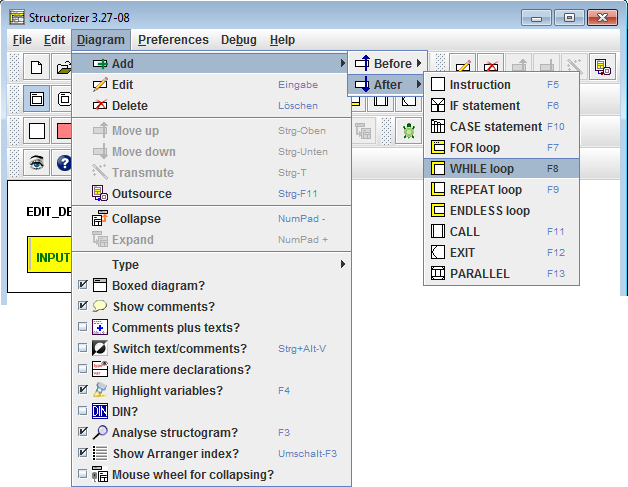 Use the menu "Diagram => Add => Before" or "Diagram => Add => After" to add a new element before or after the selected one. If you hold the Shift key pressed when clicking on the chosen button then the element will be inserted before the selected item, otherwise after it. Use the respective function key shown in the according menu item of "Diagram => Add => Before" or "Diagram => Add => After" (e.g. <F6> to append an IF statement to the selected element, <Shift><F6> to insert an IF statement before the selected element etc.). Note: double-clicking an empty block in the diagram always inserts a new element of the type "Instruction".